The last thing you want is for the steel balls you put into your ball mills to crumble, like stale cookies, on impact. You need to maintain peak pulverizing efficiency at all times. You deserve nothing less. And FOX has come up with your ball milling solution. Each FOX Forged Steel grinding ball is solid from surface to center. This is a forged steel ball that is through hardened for superior strength. 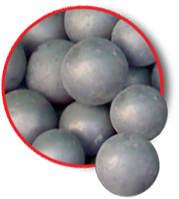 These sturdy, well built, shock-absorbing steel balls are the perfect hardness for ball mill grinding. Whether you are grinding raw materials in ball mills, or using planetary ball mills on a smaller scale to get a finer particle size, these are the forged steel balls for you. These are serious grinding balls, for serious jobs. Seriously.